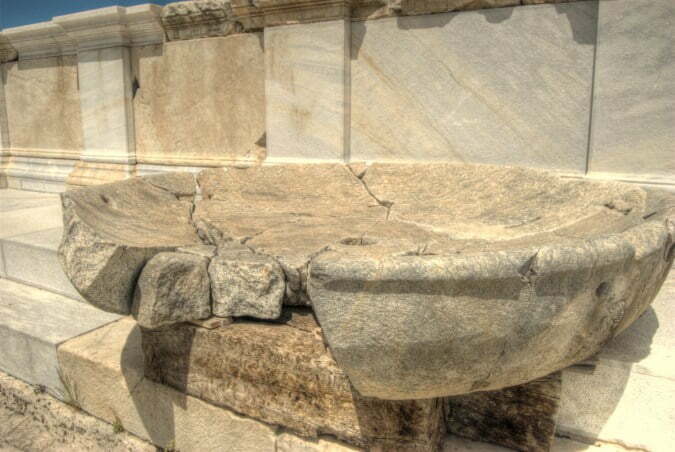 I have a goal to visit the remains of the Seven Churches of Revelation mentioned in the New Testament of the Bible, which are all in the Aegean region of Turkey. 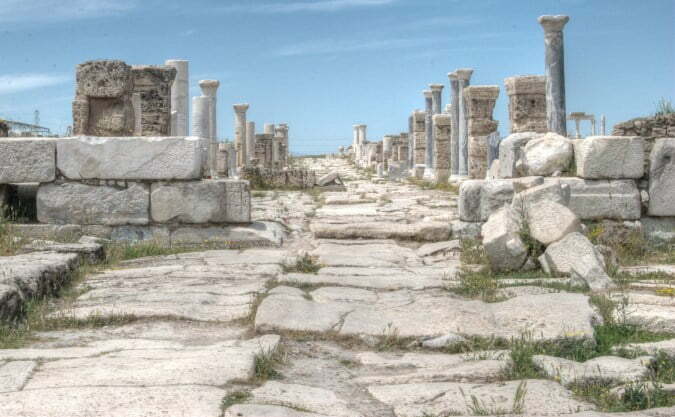 One such city was Laodicea; an extremely profitable centre of trade that did especially did well in wool, because the nearby plains provided sheep with ample grazing food. Turkey has an extremely strong Biblical history that any hard-core Christian would be a fool to ignore and slowly over my travels, I have learned in particular about the roles of Saint John and Paul, in this country at those times. Saint John wrote the letters of revelation, also known as the Apocalypse and sent them to all seven churches, giving praise for what they did well, and where they could improve. Despite their names, the letters referred not to churches but to the cities and all Christian citizens within them. 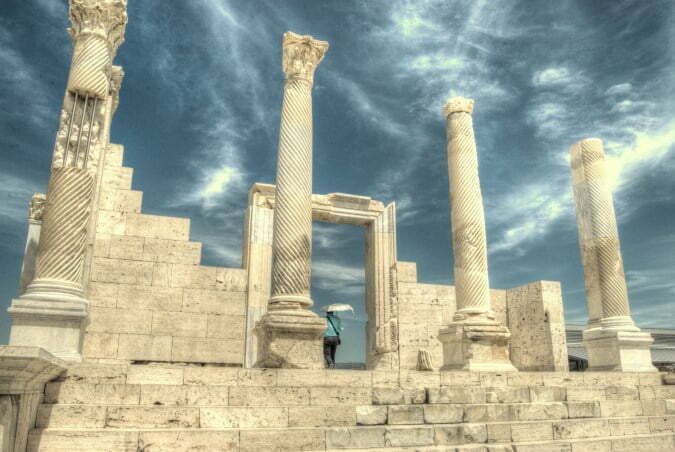 I looked into visiting Laodicea several years ago, but delayed plans since transport seemed ad-hoc and not many tour providers mention it on their itineraries. So imagine how delighted I was, when traveling back from Pamukkale, my tour guide, casually asked if I wanted to drop in and see Laodicea. “Of course, I want to see it. Let’s go, let’s go” I excitedly responded. I didn’t know it was just a short distance from Pamukkale and with the exception of a few independent travellers; no-one else was there! Walking around a virtually empty Church of Revelation with my own walking history guide, made me feel kind of super important! Its origins date from the Hellenistic era and my guide said in those days, six important factors were considered when deciding where to build a city. Is it on a trade route? Laodicea had all these and the citizens were filthy rich because of good trade connections with other cities and also because of its positions on trade routes. Yet the words from Saint John were harsh. Johns is not only referring to their great wealth but also the tepid lukewarm spring waters, flowing into the city from the nearby sources at Pamukkale. 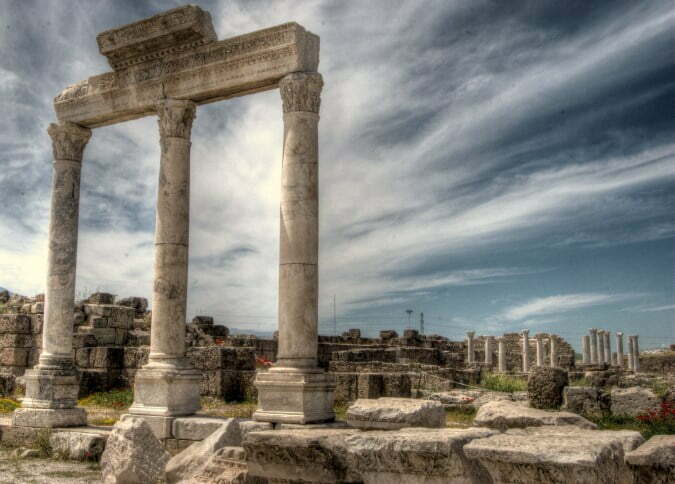 However, Laodicea was the only one of the seven churches that didn’t receive a message of compliment from Saint John. Accusing them of sitting on the fence, and not dedicating themselves 100% to Christianity, they would in later years become hard-core advocates of the religion. 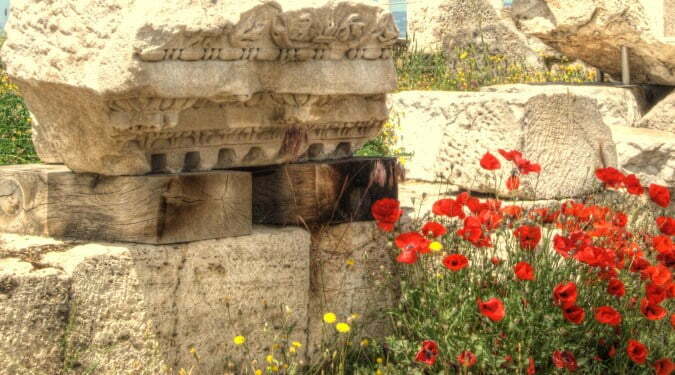 It was an ideal time to visit since it was the beginning of May and vibrant red poppies were sprouting out from between the ruins. 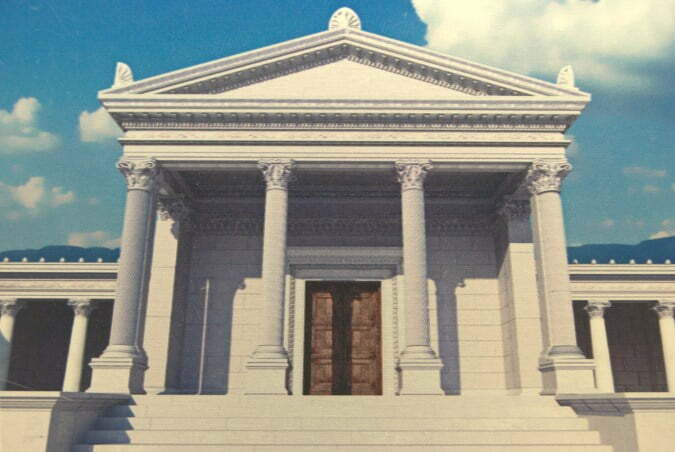 According to newspaper reports, the temple was only discovered in 2012. If true, then in 3 years they have completed a remarkable amount of work. I walked up seven stone stairs flanked by four large columns which led me into the interior of which there is no roof or walls. Instead, I stood on a glass platform covering the original layout and stones. It was hard to see through it at the structures and buildings below, but in the distance, was a marvellous view of what seemed like snow covering the hillside. 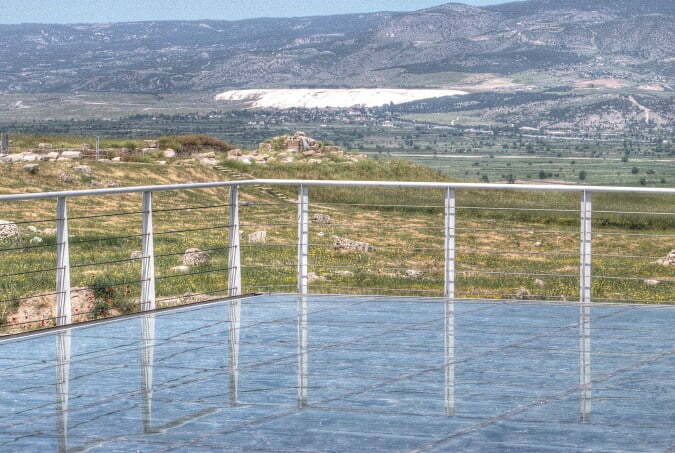 It was the white travertine pools of Pamukkale. Some sources say an earthquake in the 4th century marked the end of a lucrative timeline for the city, while others say it was destroyed during invasions by the Turks and Mongols in the 13th century. 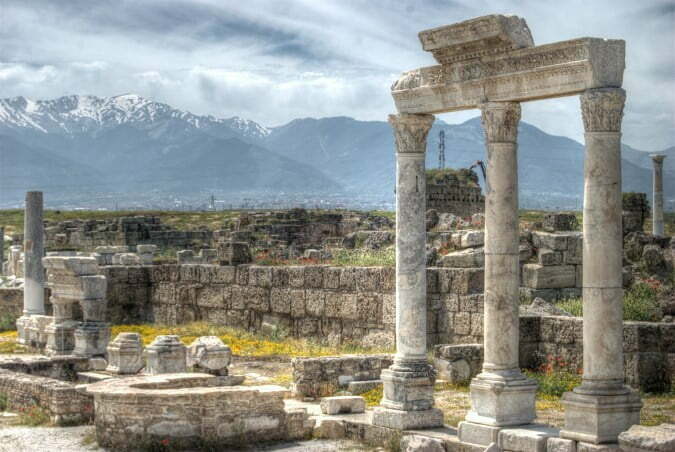 Either way, experts predict, only a fraction of Laodicea has been uncovered so I will watch for news on development because maybe in 10 years’ time, the city as we see it now, will be so much larger in which case I will return in a heartbeat. Till then, I only have 5 more churches of revelation to visit! Conundrum being the right word Pat. Spread the word but at what cost? I loved this place too, Nat. Absolutely spectacular and beautiful. But of course the more publicity it gets the more crowded it will become. The endless conundrum for travel writers. Sounds like Turkey is definitely a must-see for anyone (physically) trekking their way through the Bible. Thanks for sharing, Natalie! What a fascinating story. The Seven Churches tour has long been on my bucket list. I’m really looking forward to it now! For the sky in the photos, it was a total fluke. I shot in Raw, put them in Photomatix essentials to edit and they come out like this. Just adjusted the colour temperature a little but mainly left as is. Only shot on an old Nixon D40 as well. Your pictures are gorgeous. I think I would like Turkey so much!! . . missed this one Nat and we are regularly in the area. Really good post and you photos are stupendous – really! We were very impressed with Laodicea when we visited there in October. Don’t quote me on this, but I think we read somewhere that when complete, Laodicea will be the largest excavation site in Turkey. 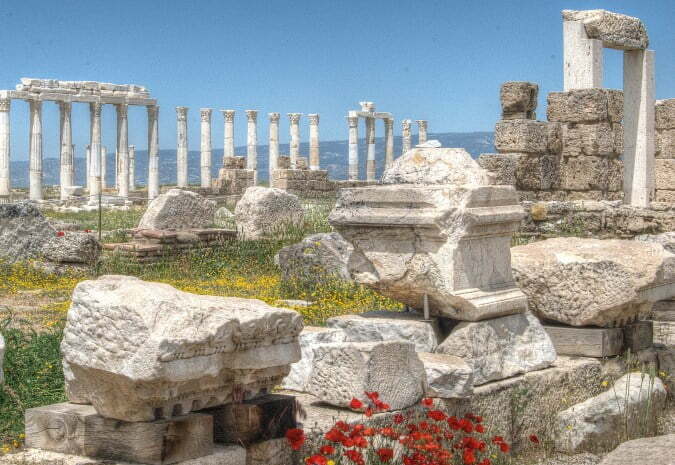 My husband’s family is coming to visit next month, and we’re excited to show them Pamukkale and Laodicea. I love the sky in your photos! Do you shoot in RAW or are these HDR? What’s your gear?